Acceptance testing, a testing technique performed to determine whether or not the software system has met the requirement specifications. The main purpose of this test is to evaluate the system's compliance with the business requirements and verify if it is has met the required criteria for delivery to end users. After the system test has corrected all or most defects, the system will be delivered to the user or customer for acceptance testing. 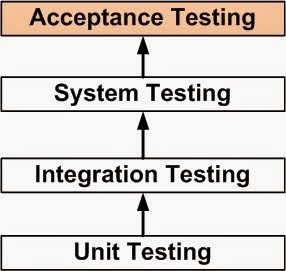 Acceptance testing is basically done by the user or customer although other stakeholders may be involved as well. The goal of acceptance testing is to establish confidence in the system. Acceptance testing is most often focused on a validation type testing. A Commercial Off the shelf (COTS) software product may be acceptance tested when it is installed or integrated. Acceptance testing of the usability of the component may be done during component testing. Acceptance testing of a new functional enhancement may come before system testing. User Acceptance test: The User Acceptance test focuses mainly on the functionality thereby validating the fitness-for-use of the system by the business user. The user acceptance test is performed by the users and application managers. Operational Acceptance test: The Operational Acceptance test also known as Production acceptance test validates whether the system meets the requirements for operation. In most of the organization the operational acceptance test is performed by the system administration before the system is released. The operational acceptance test may include testing of backup/restore, disaster recovery, maintenance tasks and periodic check of security vulnerabilities. Contract Acceptance testing: It is performed against the contract’s acceptance criteria for producing custom developed software. Acceptance should be formally defined when the contract is agreed. Compliance acceptance testing: It is also known as regulation acceptance testing is performed against the regulations which must be adhered to, such as governmental, legal or safety regulations. The acceptance test activities are carried out in phases. Firstly, the basic tests are executed, and if the test results are satisfactory then the execution of more complex scenarios are carried out.